Falling smartphone prices, cheaper data plans and an increase in local-language and mobile-first content have powered a phenomenal explosion in the number of internet users in India. In the last four years alone, India’s internet population has almost doubled to 430M. However, the number of internet users who conduct digital transactions online is still relatively low: only one in five shop online, one in six book travel packages online and even fewer pay for video and music streaming services. 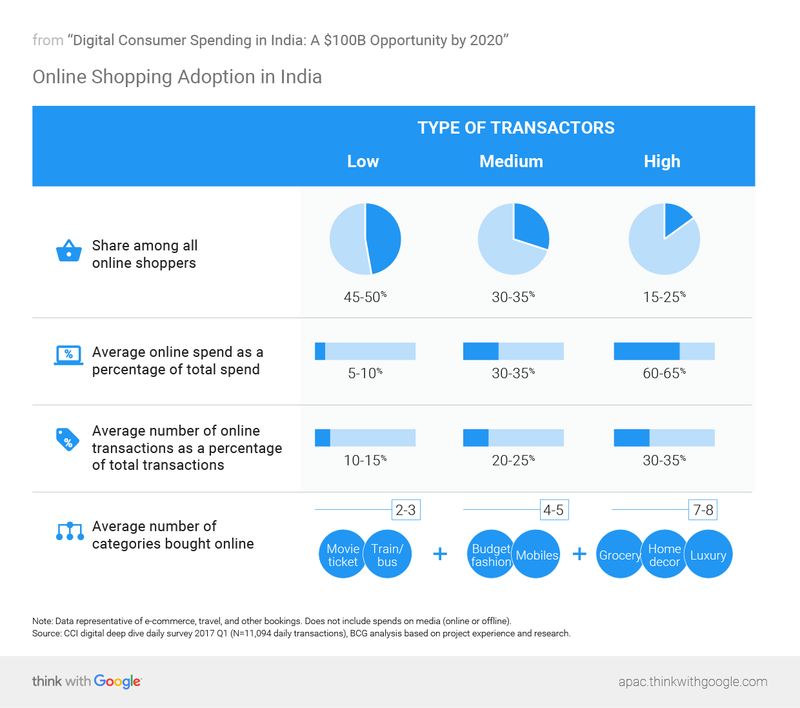 To better understand the potential for digital transactions in India, a research study, “Digital Consumer Spending in India: A $100B Opportunity,” was conducted with Nielsen and the Boston Consulting Group (BCG). The results show that today’s $40B will leap to $100B, nearly tripling by 2020. Read on as we share our key findings and discuss how brands can play an integral role this tremendous growth (full report available below). Note: Data representative of e-commerce, travel, and other bookings. Does not include spends on media (online or offline). Source: CCI digital deep dive daily survey 2017 Q1 (N=11,094 daily transactions), BCG analysis based on project experience and research. 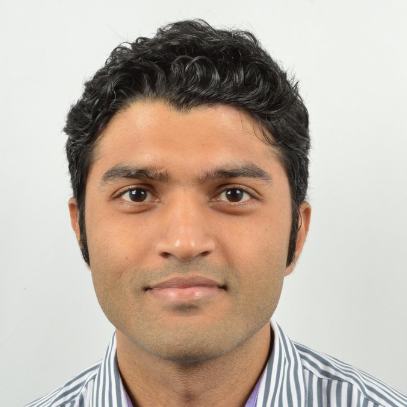 Currently, 75-80% of internet users in India do not spend online yet. They make purchases either occasionally, spend limited time online, or do not spend a significant part from their overall wallet at all. By 2020, however, with further improved infrastructure and greater digital maturity, online transactions in categories such as e-commerce for apparel, electronics, durables, and food and groceries are likely to drive rapid growth, inching us closer to the $100B opportunity. 1. In the period from Jan-Sep 2016 to 2017; Tier 1 cities include Bengaluru, Chennai, Delhi, Faridabad, Ghaziabad, Greater Noida, Gurgaon, Hyderabad, Kolkata, Meerut, Mumbai, Navi Mumbai, Noida, Pimpri-Chinchwad, Thane. 2. Google Consumer Barometer Survey, 2016. Source: BCG CCI Digital Influence 2017 Study (N=18,000), BCG analysis based on Project Experience and Research , Google search query data 2017. In addition to today’s typically male, millennial and metropolitan users, the demographic profile of online spenders will undergo a major shift in the next few years. According to estimates, there will be 2.5X as many women shoppers and approximately 3X as many older (35+ years old) shoppers as there are today. 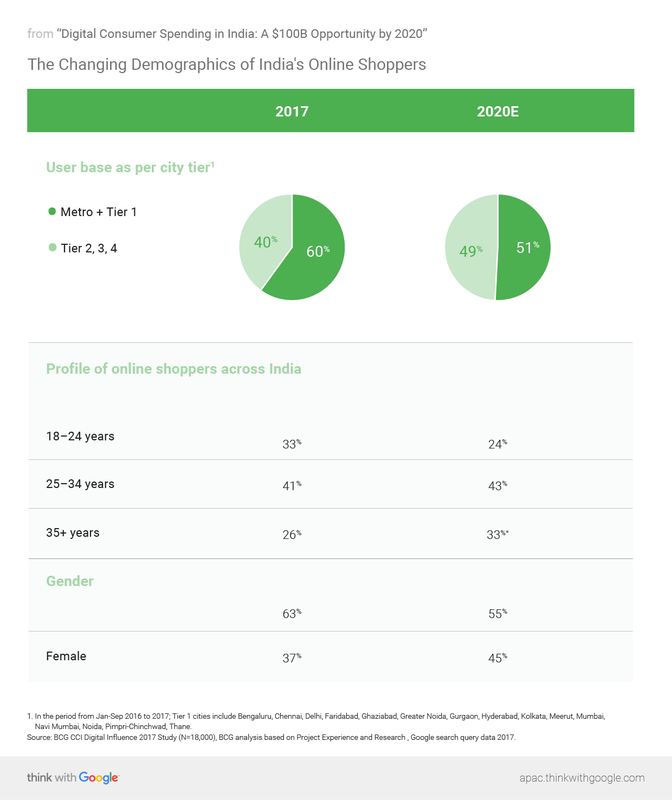 And with the steady increase in the share of search queries in India’s non-tier-1 cities, smaller markets will be hopping on the bandwagon and contributing close to 50% of the online shopper base by 2020. With this imminent growth at arm’s length, marketers need to refresh their offerings in terms of price, delivery, and return policies in order to gain their fair share of the market. The 2020 opportunity provides significant headroom for growth, with a large number of consumers continually entering the shopping funnel through different pathways and at different stages. Brands can best leverage this immense opportunity for exponential gain if they understand non-buyers’ journeys as they move from awareness to first purchase to eventual regular online shopping. This report highlights some next steps that brands can take based on consumer demands, trends and needs in order to accelerate digital spending online. Download a summary of our key findings or the full research report now.